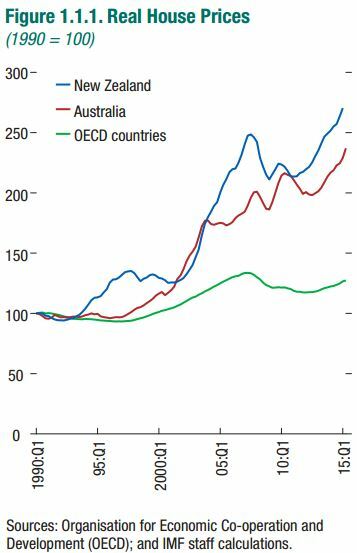 House prices in Australia and New Zealand have more than doubled in real terms since 1990, rising substantially faster than the Organisation for Economic Co-operation and Development (OECD) average (Figure 1.1.1). This increase has often been attributed to the liberalization of their banking systems during the 1980–90s and the transition to lower interest rates in the last decade (see Hunt 2015; Ellis 2005). The rise in house prices has been accompanied by a sharp increase in household debt, with debt-to-income ratios roughly tripling since the 1990s in both countries and mortgage debt accounting for a substantial share of the total. Household debt-to-income ratio is a key variable from a financial stability and macroeconomic risk perspective as it reflects the risks borne by households and the possible amplification of house price declines to the macro economy (Debelle 2004; April 2014 Regional Economic Outlook: Asia and Pacific, Chapter 2). The housing market in both Australia and New Zealand appears to reflect moderate overvaluation. Valuation ratios such as price to income are now above historical norms. While some of that is expected given low interest rates (allowing higher debt to be serviceable), other fundamental factors such as income per capita, interest rates, and working-age population suggest moderate overvaluation (see IMF 2015a, 2016c). 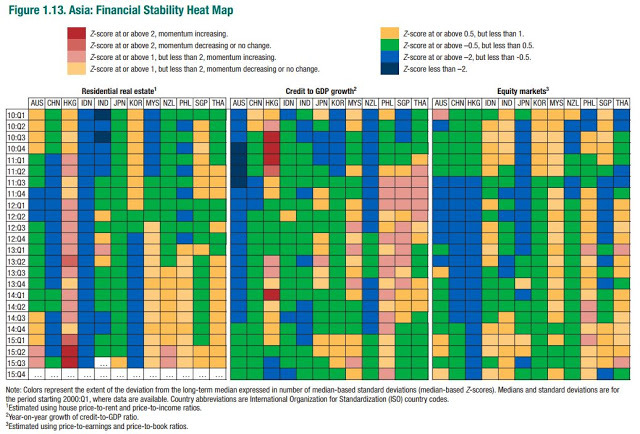 The financial stability heat map also suggests that prices are currently higher than recent trends (Figure 1.13). Concerns about house price inflation have been prominent for well over a decade and have triggered regulatory and prudential responses. Recently, the authorities in both countries have stepped up measures. In October 2013, the Reserve Bank of New Zealand (RBNZ) placed a temporary “speed limit” on high loan-to-value ratio (LVR) residential mortgage lending, whereby banks must restrict new mortgages at LVRs more than 80 percent to no more than 10 percent of their total residential mortgage lending. Although house price inflation in Auckland initially moderated in response to the measures (and tighter monetary policy), it has subsequently accelerated. In May 2015, the RBNZ announced additional measures (effective November 2015): (1) residential property investors (though not owner-occupiers) in Auckland are required to have a deposit of at least 30 percent; (2) the existing 10 percent speed limit for loans at high LVRs is retained in Auckland, while it is increased elsewhere to 15 percent to reflect the more subdued housing market conditions there; (3) a new class for loans to residential property investors was established and expected to attract a higher risk weighting than owner-occupier mortgages; (4) the 2015/16 budget introduced a new property sales tax for nonprimary residences that are bought and sold within two years; and (5) the government announced a tightening of reporting and taxation rules for foreign buyers. The Australian Prudential Regulatory Authority (APRA) has stepped up its supervisory intensity through a gradual and targeted approach. It advised banks in December 2014 that it would focus on higher-risk mortgage lending (interest-only and high loan-to-income or loan-to-value ratios), issuing guidelines to limit growth of investor lending to 10 percent a year, and strengthening loan affordability. In response to the recommendations of the Financial Sector Inquiry, APRA announced that large banks would need to hold more capital against residential mortgage exposures by raising the average risk weight (to 25 percent) for large banks. Recent data suggest that house price inflation is gradually responding to the regulatory measures, but it is too early to assess whether such inflation is at more sustainable rates. Can the banking sector withstand a housing downturn? Four large Australian-owned banks account for the bulk of banking sector assets in both Australia and New Zealand. Against this background, the authorities in both countries have collaborated on stress testing, including a combined scenario with a severe downturn in the housing market (40 percent cumulative decline) (APRA 2014). While this extreme scenario would have a substantial adverse impact on profitability and capital ratios, with losses on residential mortgages accounting for about one-third of total credit losses, minimum capital requirements are not breached. However, banks with substantially reduced capital ratios would be constrained in their ability to raise funding, impacting credit growth and aggregate demand.